Discover the Philadelphia Plan which gave us two Art Deco masterpieces, the monumental 30th Street Station and Suburban Station, the first all-underground rail terminal. The tour starts at 30th Street Station and proceeds via trolley to 19th St. From the Comcast tower lobby descend into an underground concourse network to the site of The Gallery, before ending at Reading Terminal and the Marriott Hotel. Along the way, lament the loss of Broad St. Station and learn about the 1905-mid-50s trolley and subway lines, the Broad Street subway (1928), the Commuter Rail Tunnel (1984), and the former Reading Terminal, now part of the Pennsylvania Convention Center. 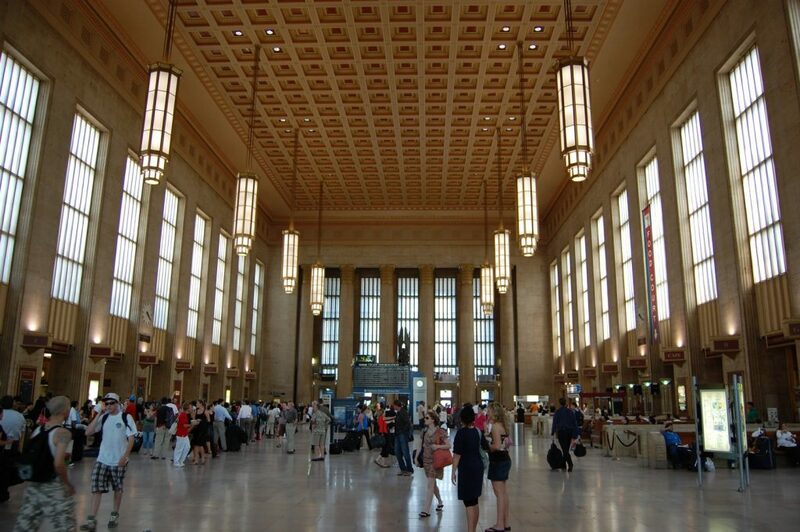 Meet at the Angel statue in the main concourse of the 30th Street Station, near the east entrance. PLEASE NOTE: Guests must provide their own SEPTA fares. This tour requires climbing some stairs, though escalators and elevators are available at most points.